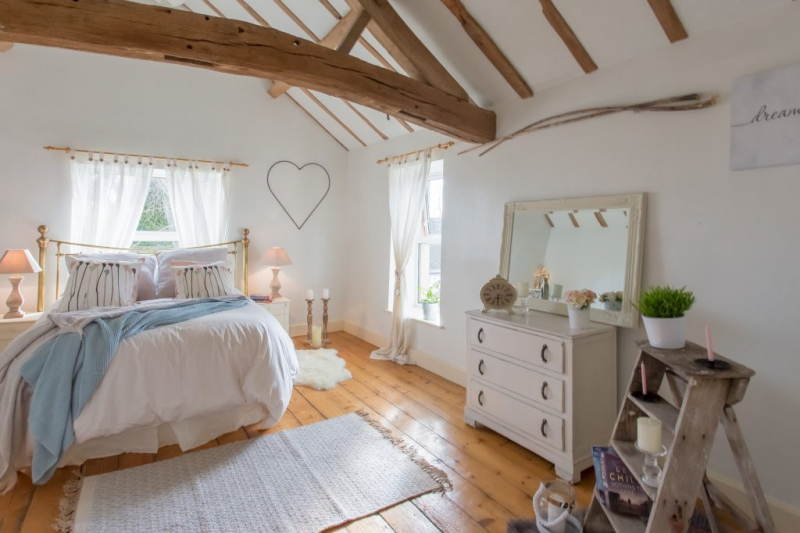 Holly House is a large 5 bedroom country cottage positioned on the outskirts of Hereford and sits beautifully elevated overlooking breath taking rolling pastures, which Herefordshire is so famously celebrated for. Sandwiched between Worcestershire and the Brecon Beacons of Wales, this county is not short of rural charm and rustic image. After many years of enjoying Holly House as a family home, the vendors had moved abroad with their furniture and fittings, leaving the property empty. It was on the market for ten months without any offers and little interest, during which time the asking price was reduced by £25,000 but remained unsold. The vendors were considering reducing it yet again when someone recommended they Stage their home. Needless to say, we were delighted to be asked to work on this property and showcase the properties full potential. We wanted to reflect the outside rural and rustic charm inside the property & reinstate the country cottage feel, whilst emphasizing the gorgeous period features. We also felt that such a beautiful property deserved a family to love it & make memories there, so we decided to dress it to appeal to the family market by creating a nursery and a child’s bedroom. We proposed using soft creams, whites and pastel colours in the majority of rooms, with lots of textures & accessories to add elegance. The vendors loved these ideas so gave us the thumbs up. The large empty dining room was probably the biggest challenge, as with its open expanse of original red and black Victorian quarry floor tiles, feedback suggested that people felt overwhelmed by the intensity of the tiles and also confused as how to use that space without having furniture in place for reference sake. To overcome this, we decided to split the space into two. At one end, we created a luxurious dining area near the open fire where we could enable people to visualise dinner parties, wine and candles! Then at the other end of the room, we created a little cosy intimate area with 2 armchairs & a small stool, encouraging people to visualise themselves having morning coffee & reading their papers. We felt, that by breaking the room into 2 different areas, it helped the space to feel more manageable to viewers & that their current furniture would fit rather than them having to feel they would need to buy bigger pieces. We wanted the original quarry tiles to be admired, but not to be over bearing, so we added a large cream rug which helped to bring some balance. We allowed the black tiles to influence the dining space, by painting the dining table legs black & adding various gold accessories to compliment the overall feel. The kitchen seemed dated to people viewing the property and people commented on having to install a new kitchen. With a red tiled floor, wooden cupboards and a wooden work surface, we wanted to add some contrast to the brown palette & bring some light into it. We did this by painting the kitchen cupboard doors an elephants breath grey and replacing existing handles, which helped to freshen & brighten the whole space. As we were aiming to achieve a rustic, country mood throughout the rooms, we decided to buy one-off pieces of furniture from local antique shops and markets; and painted them where necessary. This added character to the property that we felt would have lacked if we had purchased furniture from the high street retailers. We, along with the vendors, were delighted with the end result, and it was fantastic to hear that a 1st offer had been made the next day after it had gone live. And even better to hear it sold 2 weeks later to a family who are dreaming of creating their forever home! A happy ending for all! Below are a few more images of the whole project - simply beautiful!